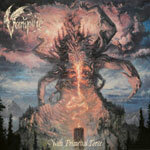 Vampire's self-titled debut from 2014 caused quite a stir when it was released and they were hailed by many as the best old-school death metal worshippers in years. Admittedly, they nailed the sound of early Death and Nihilist quite well, but in my opinion the quality of the material presented on said album was nothing out of the ordinary. Enjoyable, but nothing I have returned to since. Three years later, the band's sophomore 'With Primeval Force' shows Vampire progressing in a rather unexpected direction. The debut found itself right between the thrash and death metal sounds of the late 80's/early 90's. This album, however, is a rather straightforward thrash affair with influences from both death metal as well as early 80's heavy metal topped by raspy death growls. This change of direction actually makes some sense, Sweden has seen a nice string of traditional heavy metal bands lately and there is plenty of inspiration around. The result is in part some nice songs with melodic catchy riff work draped in a head banging friendly shroud reeking of a mid-80's beer marinated thrash feast. But in part, this album is also some forgettable songs which fails to invoke any kind of reaction. In particular, the acoustic and moody sections feels misplaced and breaks the flow whenever the album falls into one. At the end of the day, the album has a few excellent highs but an equal number of space filling lows. I can see the wish from Vampire to try a different direction and I am quite pleased they steered away from the soft mushy path taken by contemporaries such as Morbus Chron and Tribulation. This album contains plenty of more attitude than either of the aforementioned acts latest offerings. I can see plenty of people hailing 'With Primeval Force' as the ultimate combination of rancid late 80's death/thrash and beer-fueled classic heavy metal. To me, however, the material is simply not there yet to deserve unanimous praise.